BRUSSELS (Reuters) - The United States would have to reconsider whether to use force in Syria if President Bashar al-Assad failed to comply with a U.N. resolution demanding the eradication of his chemical weapons, the U.S. Army chief of staff said on Wednesday. Asked if the U.S. military might still have a role to play in the Syria crisis, General Ray Odierno told Reuters in a telephone interview: "We will have to wait and see. I think a lot of it depends on how well the agreement goes." The U.N. Security Council adopted a resolution last Friday that demanded the eradication of Syria's chemical weapons but did not threaten automatic punitive action against Assad's government if it did not comply. The resolution was based on a deal between the United States and Russia reached after an August 21 sarin nerve gas attack on a Damascus suburb that killed hundreds. The deal averted U.S. military action against Assad's government, which Washington blamed for the August attack. The Syrian government and its ally Russia blamed rebels for the attack. Despite the deal, U.S. President Barack Obama has kept the option of military force on the table. 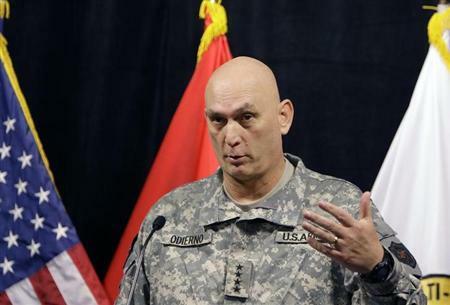 Odierno said the United States was encouraged by the deal with Russia. "If it doesn't, if something goes wrong, then I think we will have to reconsider whether we use force in Syria or not," he said, speaking from Germany where he was attending the Conference of European Armies.